To browse and establish a good value for Crafts and Markets in Kenya, if you have the time, go to downtown Nairobi’s Biashara Street neighborhood. It has a huge variety of, well, everything at fixed and very reasonable prices. Unless you’re after certain antique sculptures, masks and xylophones, you would have a hard time matching these prices by bargaining anywhere else. And probably a lot more hassle. For traditional fabrics and cloths such as kikois, kangas and kitenge’s, there is also a brilliant assortment of shops along Biashara Street , where you can explore and get the best prices around. The traditional Maasai Markets are being held on different days during the week at different location throughout Nairobi. There is one at Junction Mall on Thursday’s, Galleria Mall has a permanent one and at Village Market on Friday’s! Kariokor Market is a huge open-air market where you can find everything from traditional fabrics and souvenirs to food items such as vegetables, fish, fruit etc. NOTE: Be careful and advised that when visiting any of these busy markets, to better leave all your valuables at the hotel and to watch out for thieves at all times and keep your backpack/handbag close to you (best in front). 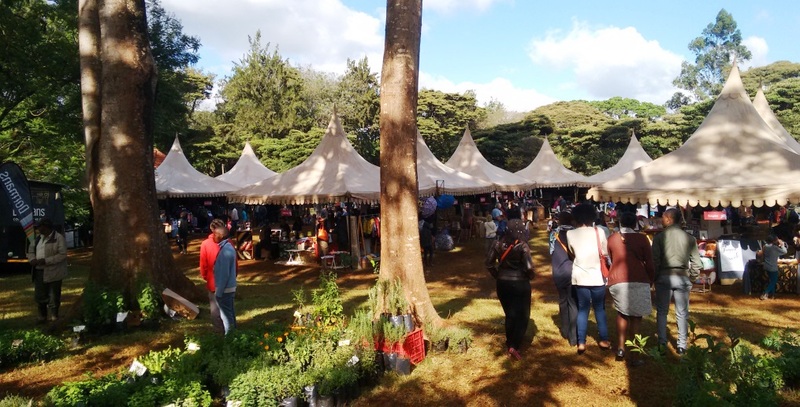 Nairobi has also a number of craft shops or community craft centers, which have charitable status, and/or associated with development or self-help projects. They can be sometimes a bit expensive and most of the time you cannot really bargaining, but they often have unusual and unique items, that make great gifts and souvenirs. Art Craft Events & Festivals, like Bizarre Bazaar, Bargain Box etc have become very popular and they happen throughout the year. Following is a List of brilliant Crafts and Markets that often create many of their own items/products, support local women, help the environment and in general produce amazing things that are very unique to Kenya!! Enjoy! Shuka Duka is a funky shop that specialises in all things shuka! They use different thicknesses of shuka to create picnic blankets, fleece lined blankets, hot water bottles, beanbags, oven mitts, safari chairs and stools, bags and a range of other textile goods. The show piece of the shop is the Beads of a Feather jewellery bar, where you can make your own jewellery collection from over 50000 beads! Elephants4Life came into being from an urgent need to save our elephants from extinction! All bags are handcrafted by Kenyan artisans using natural leather & African fabrics! By buying one of the Bags you will be directly contributing to this education initiative & helping in our struggle to try & protect these majestic creatures. It is a little on the expensive side but it is a great place for presents and last minute shopping to bring gifts home to friends. It supports self-help groups that create wonderful crafts in skillful, naturally based packaging. Karim Kara is a Kenyan born and bred, self taught, independent filmmaker and photographer. He uses his photography as an Art-form and as a vehicle to educate people and to raise awareness about the dire situation that the animals, especially the Elephants, face in the ever so fast changing environment in Kenya. If you like recycle glass art, this is the place to check out! The colors mainly used are dark blue and aquamarine. Especially the drinking glasses are wonderful! The factory is close to Nairobi and you can go for visits easily. At Maro designs we are “women working for women”! Many of our employees are single mothers. Our products are Eco-friendly, using leftover CowHorns and CowBones are the main raw material, including up-cycled metal, cotton and glass. They are skillfully crafted and combined into unique contemporary jewelry for women with style! Every necklace a unique piece of art! Kazuri, (small and beautiful), works with nearly 300 formerly impoverished women, that create an extraordinary variety of handmade jewelery and beads, mainly from ceramic. Bold and colorful designs present the culture and wildlife of Kenya. The stuff is expensive, but very lovely. You can watch the whole process when you go for a visit. There are retail outlets at Village Market, Limuru Rd, Westlands, and the Junction Shopping Centre, Ngong Rd. This studio sells the usual stuff like paintings, beaded and leather items. It also has a bit of unusual crafts, which is made from recycled plastic flip-flops, including sculptures and jewelery. There is a cafe and kids will have a chance to use the playground. One Way produces a range of high-quality products made from kikoy fabrics. It includes clothing like pants, shorts & skirts, sarongs, table cloths, beach bags and t-shirts. They have several branches in Nairobi including the Sarit Centre, Yaya Centre and Village Market. A large shop selling a lot of good stuff – crafts, textiles, woolen goods and jewelery, much of it made by self-help groups and individuals, including Meru’s Makena Textile Workshop. Single mothers from the Kibera slum, using local wool, cotton and plant dyes, supply this 'rug gallery' with a variety of different woven rugs.